Guidebook for Divorcing Parents | STEP-Carefully! for Stepparents! During your class, I will cover the most important basic facts you need to know. Your children will be affected by your divorce in several different ways. You need to be aware of all those effects so you can help them move on to a healthy life. Unfortunately, in the limited time this court mandated class allows, I am only able to skim the bare fundamentals – about 15% of the facts you need to know for your kids to recover. Fortunately, I have compiled everything I have learned – in more than 20 years teaching and researching divorced families – into a comprehensive report. 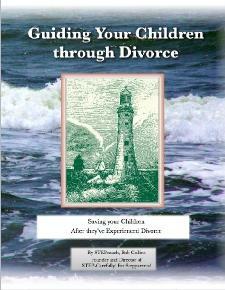 The Divorcing Parents’ Guidebook tells you in full detail what your children need you to know. I’ve made sure this report is easy for you to move through, comprehend, and refer back to as needed. You’ll find everything I taught in the class, so you can remember it later – PLUS tons more ways you can guide your children that we didn’t have time to cover. From background reasons for their acting out, to methods you want to avoid so you don’t cause more damage, to the latest information to help you and your children move on from your divorce into a new, happy life. You won’t find any other resource anywhere – especially no guidebook – like this, designed just for your family. This guidebook follows up and refers to the lessons you have already heard in the state-mandated class. This full length, comprehensive guidebook is only $9.98. This is an electronic copy (an eBook) so you can keep it handy on all your devices, whenever you need it.